Louie the Leprechaun is a brand new St. Patrick’s Day tradition. Ever wonder why you’ve never found a four-leaf clover? Has your milk turned green or can’t find your shoes on the morning of St. Patrick’s Day? Well this tale gives you all the answers to these questions and more. An entertaining children’s story for all to read and enjoy, whether they are Irish or non-Irish this St. Patrick’s Day. Included with the book is adorable 12″ Louie stuffed toy that can be played with throughout the year to remind you of the laughter he brings on St. Patrick’s Day. A Must-Have! The Louie the Leprechaun set contains a 12″ plush “Louie” stuffed toy and a 8 1/2″ X 11″ hardcover book. 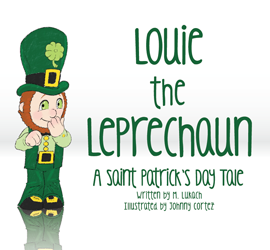 The story is about a mischievous leprechaun, named Louie, that visits children on St. Patrick’s Day. Add a touch of the Luck of the Irish to your home today. 12″ tall plush. Ages 3 & up.